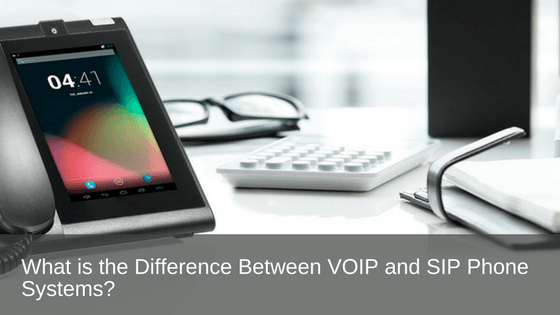 What is the Difference Between VOIP and SIP Phone Systems? VoIP and SIP are terms used when referring to voice over IP. VoIP simply stands for Voice over Internet Protocol (VoIP), whereby SIP stands for Session Initiation Protocol (SIP). Although VoIP and SIP are part of business phone systems, they are actually two completely different species. Below, we have compiled a list so you can determine the difference between VoIP and SIP. VoIP operates on the technology of transporting voice over packet networks, which basically means that phone calls on the VoIP telephone system are made and received over the internet. VoIP phone technology has replaced the previous and more traditional PSTN networks and mobile networks that were once the only form of telecommunications. VoIP has become popular due to the advancement in internet and network technology, which saw the introduction of voice over data networks receive carrier-grade quality. VoIP technology is used with applications like Skype or Google Talk, with any IP-enabled PBX hardware or through a hosted VoIP telephone service. What is a SIP system? SIP is an application layer protocol which is put to work to set up, change, and terminate multimedia sessions just like VoIP telephone calls. SIP can hook up new sessions to already occurring sessions like in the instance of a multicast conference, and can be used for instant messaging, media distribution, and other applications. SIP acts as the signalling protocol within a VoIP telephone system and can manage all of the call requirements such as establishing the call, controlling the call, and ending the call. SIP is also capable of generating Call Detail Records (CDR) for invoicing purposes. SIP trunking is a system that delivers telephone services and communication requirements to businesses who have SIP-enabled PBX and unified communication resources. SIP trunks are deployed to connect the PBX with the telephone network thus replacing the requirement for legacy phone lines or Primary Rate Interface. This allows more flexibility in the selection of the IP-PBX hardware and software required, providing a more tailored solution for each business. The other way to arrange a VoIP telephone system is to have a hosted IP PBX, which means you don’t have to worry about obtaining the hardware or setting up the SIP trucking yourself as the VoIP system will be pre-configured for you. SIP trunking is growing steadily in popularity as the preferred way of deploying VoIP. SIP offers reduced costs, augmented efficiency, and presents options for expanding your phone system, compared to older telephone systems. In a nutshell, there really is no comparison possible when it comes to a VoIP telephone system and SIP. VoIP refers to a technology that is used in modern telecommunications and includes the signalling required to run the system. SIP is an industry-standard method of achieving VoIP as a signalling and control protocol. If you are a business looking to move to a VoIP telephone system be sure to weigh up and carefully consider the various ways that SIP can be deployed to take advantage of what will work best for you. If you could benefit from some expert advice on VoIP telephone systems and recommendations on suited options for your business, get in touch with our team online or give us a call on 1800 007 229 or visit www.prosum.com.au we’d love to hear from you. We have the knowledge and know-how to arrange the perfect telephone system for your needs.